Study: More than two million deaths a year are attributed to poor air quality. 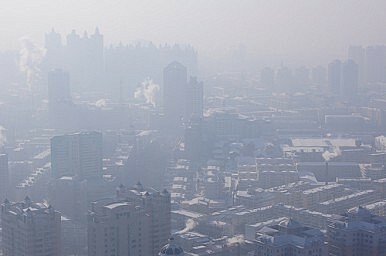 According to a new study, printed in the journal Environmental Research Letters, more than two million people lose their lives each year due to poor air quality. Researchers found that approximately 2.1 million premature deaths are the result of anthropogenic increases on fine particulate matter – which includes dust, soot, and smoke – measuring less than 2.5 micrometers in diameter (PM2.5). Nearly half a million more perish due to human-created ozone pollution. The study, titled Global premature mortality due to anthropogenic outdoor air pollution and the contribution of past climate change, was led by scientists from the U.S. Environmental Protection Agency, NASA, and the University of North Carolina at Chapel Hill. East Asia tops the list, with researchers claiming more than one million deaths from PM2.5 pollution and over 200,000 dying from ozone pollution. India is the second most deadly place for air pollution, with nearly 400,000 deaths blamed on the inhalation of particulates and over 100,000 dead each year due to ozone pollution. Southeast Asia was ranked third most dangerous, with more than 150,000 deaths caused by PM2.5 air pollutants and over 30,000 lives cut short by ozone pollution. Just over 2000 particulate-related deaths and 1500 ozone pollution-related deaths were confirmed as directly caused by past climate change. “It's not good news, however you look at it: the warming climate is still prompting more air-pollution deaths than if we lived in a globally stable atmosphere,” said The Atlantic. Ioane Teitiota’s bid for asylum fails to set precedent after third and final refutation.